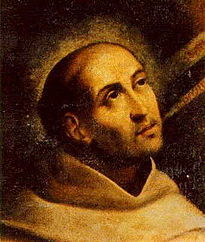 Saint John of the Cross (June 24, 1542 – December 14, 1591), born Juan de Yepes Alvarez, was a major figure of the Counter-Reformation, a Spanish mystic, Carmelite friar and priest, born at Fontiveros, a small village near Ávila. Best known for his introspective poetry and writings on the growth of the soul, his works are considered a peak in the literary landscape of Spanish writing and the summit of Spanish mystical literature. In particular, he is the renowned author of the "Dark Night of the Soul," a term that is still widely used in Christian spiritual practice today. In addition to his mystical writings, John of the Cross founded the Discalced Carmelites along with Saint Teresa of Avila. John of the Cross was canonized as a saint in 1762 by Pope Benedict XIII and is one of the thirty-three Doctors of the Church. His original feast day was November 24. The 1969 calendar reforms placed his feast day on his date of death, December 14. John of the Cross was born in 1542 under the name of Juan de Yepes Alvarez into a Jewish converso family in a small community near Ávila. His father died when he was young, and so John, his two older brothers and his widowed mother struggled with poverty, moving around and living in various Castilian villages, with the last being Medina del Campo, to which he moved in 1551. There he worked at a hospital and studied the humanities at a Society of Jesus (Jesuit) school from 1559 to 1563. The Society of Jesus was a new organization at the time, having been founded a few years earlier by the Spanish St. Ignatius Loyola. On February 24, 1563, he entered the Carmelite order, adopting the name Fr. Juan de Santo Matía. The following year (1564) he professed as a Carmelite (was promoted from novice status) and moved to Salamanca, where he studied theology and philosophy at the University and at the Colegio de San Andrés. This stay would influence all his later writings, as Fray Luis de León taught biblical studies (Exegesis, Hebrew and Aramaic) at the University. León was one of the foremost experts in Biblical Studies then and had written an important and controversial translation of the Song of Songs into Spanish. Ordained as a priest in 1567, Saint John of the Cross indicated his intent to join the strict Carthusian order, which appealed to him because of its encouragement of solitary and silent contemplation. Before this, however, he traveled to Medina del Campo, where he met the charismatic Saint Teresa de Jesús. She immediately talked to him about her reformation projects for the Carmelite order, and asked him to delay his entry into the Carthusians. The following year, on November 28, he started this reformation at Duruelo together with Fr. Antonio de Jesús de Heredia, and the originally small and impoverished town of Duruelo became a center of religious activity. John, still in his 20s, continued to work as a helper of Saint Teresa until 1577, founding monasteries around Spain and taking active part in their government. These foundations and the reformation process were resisted by a great number of Carmelite friars, some of whom felt that Teresa's version of the order was too strict. Some of these opponents would even try to bar Teresa from entering their convents. The followers of St. John and St. Teresa differentiated themselves from the non-reformed communities by calling themselves the "discalced," i.e., barefoot, and the others the "calced" Carmelites. On the night of December 3 and 4, 1577, following his refusal to relocate after his superior's orders and allegedly because of his attempts to reform life within the Carmelite order, he was taken prisoner by his superiors, and jailed in Toledo, where he was kept under a brutal regimen that included public lashing before the community at least weekly, and severe isolation in a tiny stifling cell barely large enough for his body. He managed to escape nine months later, on August 15, 1578. In the meantime, he had composed a great part of his most famous poem Spiritual Canticle during this imprisonment; his harsh sufferings and spiritual endeavors are then reflected in all of his subsequent writings. After returning to a normal life, he went on with the reformation and the founding of monasteries for the new Discalced Carmelite order, which he had helped found along with his fellow St. Teresa de Ávila. He died on December 14, 1591. His writings were first published in 1618, and he was canonized by Benedict XIII in 1726. In 1926, he was declared a Doctor of the Church by Pope Pius XI. When inserted into the Roman Catholic calendar of saints in 1738, his feast day was assigned to November 24. Pope Paul VI moved it to the dies natalis (birthday to heaven) of the saint, December 14. The Church of England commemorates him as a "Teacher of the Faith" on the same date. St. John of the Cross is considered one of the foremost poets in the Spanish language. Although his complete poems add up to less than 2500 verses, two of them—the Spiritual Canticle and Dark Night of the Soul—are widely considered to be among the best poems ever written in Spanish, both for their formal stylistic point of view and their rich symbolism and imagery. The Spiritual Canticle is an eclogue in which the bride (representing the soul) searches for the bridegroom (representing Jesus Christ), and is anxious at having lost him; both are filled with joy upon reuniting. It can be seen as a free-form Spanish version of the Song of songs at a time when translations of the Bible into the vernacular were forbidden. Dark Night of the Soul (from which the spiritual term Dark Night of the Soul takes its name) narrates the journey of the soul from her bodily home to her union with God. It happens during the night, which represents the hardships and difficulties she meets in detachment from the world and reaching the light of the union with the Creator. There are several steps in this night, which are related in successive stanzas. The main idea of the poem can be seen as the painful experience that people endure as they seek to grow in spiritual maturity and union with God. A year after writing this poem, in 1586 he wrote a commentary on Dark Night of the Soul with the same title. This commentary explains the meaning of the poem verse by verse. St. John also wrote four treatises on mystical theology, two of them concerning the two poems above, and supposedly explaining the meaning of the poems verse by verse and even word by word. He actually proves unable to follow this scheme and writes freely on the subject he is treating at each time. The third work, Ascent of Mount Carmel is a more systematic study of the ascetical endeavour of a soul looking for perfect union, God, and the mystical events happening along the way. A four stanza work, Living Flame of Love describes a greater intimacy, as the soul responds to God's love. These, together with his Dichos de Luz y Amor, or "Sayings of Light and Love," and St. Teresa's writings, are the most important mystical works in Spanish, and have deeply influenced later spiritual writers all around the world. Among these can be named T. S. Eliot, Thérèse de Lisieux, Edith Stein (Teresa Benedicta of the Cross), and Thomas Merton. John has also influenced philosophers (Jacques Maritain), theologians (Hans Urs von Balthasar), and pacifists (Dorothy Day, Daniel Berrigan, and Philip Berrigan). He is also mentioned in Allen Ginsberg's groundbreaking poem "Howl." ↑ Jose Vincente Roddriguez, Biographical Narrative, God Speaks in the Night. The Life, Times, and Teaching of St. John of the Cross (Washington D.C.: ICS Publications, 1991), 3. ↑ Norman Roth, Conversos, Inquisition, and the Expulsion of the Jews from Spain (Madison, WI: The University of Wisconsin Press, 1995), 157, 369. ↑ It was controversial because the translation of the Bible into the vernacular was not allowed then in Spain. ↑ Calendarium Romanum (Libreria Editrice Vaticana, 1969), 110. ↑ Calendarium Romanum, p. 146. History of "John of the Cross"